6/24/2015 United States - Have the original build sheet from Chevrolet showing the date the car was built, what options were ordered, and the destination for shipment (Hollywood, FL). Above Added: Wed June 17, 2015, 5:30 pm EST. 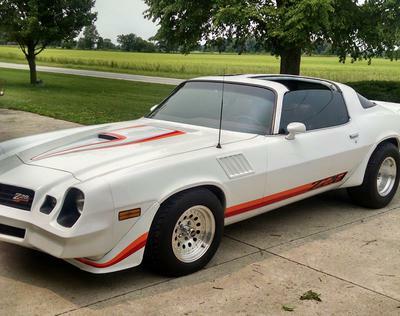 I have a pristine 1979 Camaro Z-28 for sale. The VIN plate verifies it is an original Z-28 with 350 motor that was built in Norwood, OH. It spent the majority of its life in Florida, so it has NO rust, and never had any rust, plus there are only 74,017 original miles. In fact the original jacking instructions are still on the trunk lid. It is powered by a 350 w/mild cam, Edelbrock Performer intake and Holly 600 carb, headers, HEI ignition, Accel coil, Taylor wires, 3 in. stainless exhaust and mufflers, and chrome valve covers and air cleaner. It has a 350 trans that was totally rebuilt and has 0 miles on it, and a GM 12 bolt 4:11 rear. This car was just professionally painted in Ermine white and new factory spec. Z-28 graphics were applied as well. It has red leather interior and excellent carpet. This is a highly optioned car with T-tops, tilt wheel, AC (the compressor was removed before I got the car but all the rest is there), PS, PB, PW, PDL, cruise control, rear defroster, intermittent wipers, extra gauges plus the original speedo and tach work fine, and there is a late model Sony stereo. It has American Racing wheels all around with excellent Mickey Thompson tires, and has air shocks. You will not find a better looking original Z-28 with these factory options. This car is not being driven and is waiting for the next owner to cruise down the road with the T-tops off and the radio up. Additional pictures available to an email address. Join in and write your own page! It's easy to do. How? Simply click here to return to Camaros.